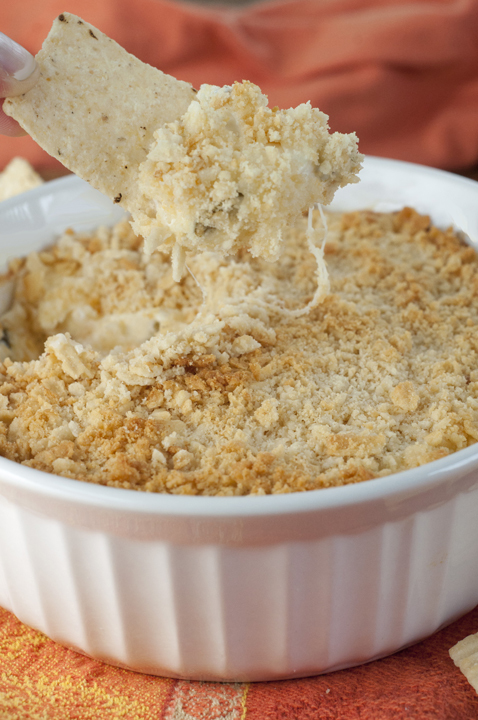 Cheez-It Crusted Jalapeño Popper Dip recipe tastes exactly like a jalapeño popper with a crunchy, cheesy Cheez-It topping. It’s an easy, incredibly tasty and highly addictive appetizer! Cheez-Its have been a part of my life since I was a little kid. I ate them like it was my job growing up. No matter how old I get, they will always hold a special place in my heart. I love incorporating them into recipes as this just gives me another excuse to eat them in one form or another. That is where this Cheez-It Crusted Jalapeño Popper Dip comes in to play. This an easy, delicious dip to just enjoy at home (think holidays or game day food) or for taking to parties and potlucks (make sure you double or triple up on the recipe)! It tastes amazing, can be made without much fuss, and you can adjust the spice level according to everyone’s tastes. 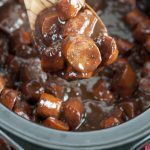 Speaking of game day food, unless you are living under a rock you know that this is the peak of basketball bracket season! Do you fill out a bracket? I’m not the world’s biggest basketball fan by any means, but I grew up with two brothers and a father who are sports fanatics so I am no stranger to the sport. Also, I love an opportunity to whip up some indulgent snack food to share with my readers. To me, the best basketball game day food is anything you can consume without needing a fork and knife, am I right? Jalapeno Popper dip is an appetizer I have been dying to make for a while now because I am dip-obsessed. Then I thought to myself – why don’t I make the dip with ground up Cheez-Its on top instead of the usual bread crumb topping? It all began when I was strolling down the food aisles at Target and I found myself on the snack & cookie aisle (big surprise). I was so excited to find a new kind of Cheez-Its: Cheez-It Grooves! I grabbed the Sharp White Cheddar kind and one box of original Cheez-Its and never looked back. You know that saying “never go shopping when you’re hungry”? I like to go against that rule on a regular basis. I had to make them into a delicious and highly addictive dip – and that is what I did. Enjoy this madness of March and whip this bad boy up for your basketball game-watching party. This dip smelled so good in the oven! My whole house smelled of Cheez-It Crusted Jalapeño Popper Dip goodness. So, eat Cheez-Its plain, or cook with them – either way, just eat them. 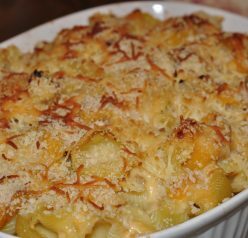 If you like using Cheez-It’s in a recipe, check out the Cheez-It Macaroni and Cheese I made recently. It is to die for! 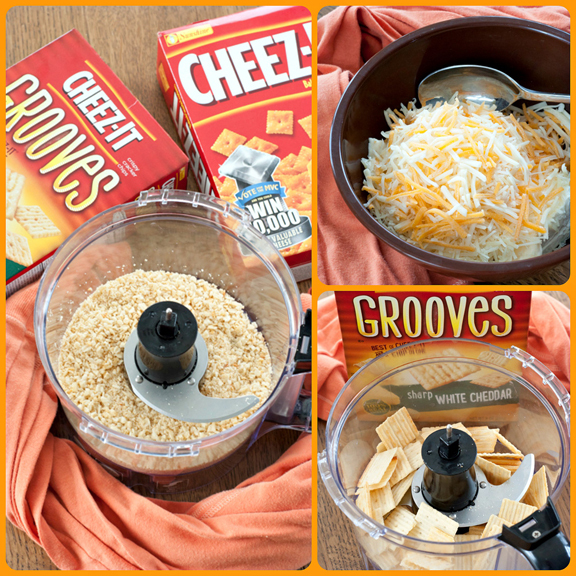 Have you ever used Cheez-Its in a recipe before? Cheez-Its are currently on sale for 3/$8 at Target can be found in the chips/crackers/cookie aisle. 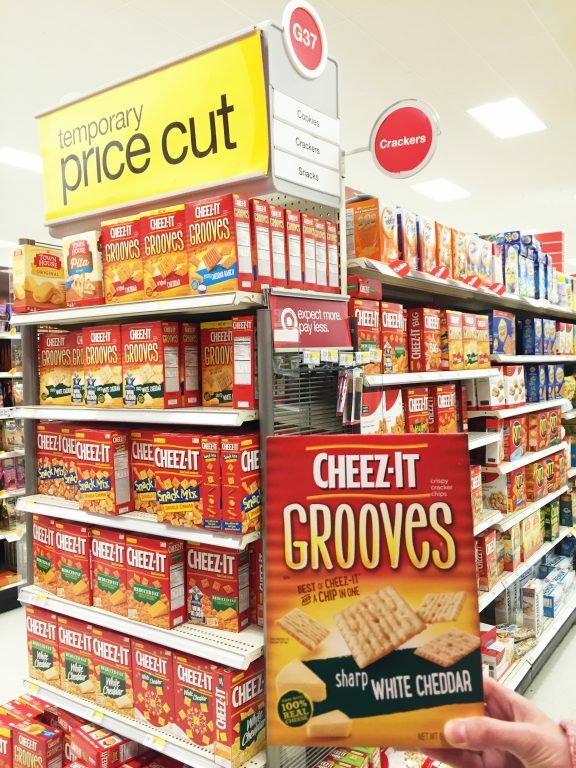 Shoppers can use Target’s Cartwheel app to save an additional 35% off of this sale price when they buy 3 varieties of Cheez-Its. You can also head over and enter the Most Valuable Cheese Contest where you get to vote on your favorite flavors/varieties from six popular Cheez-It flavors and play some fun games for a chance to win $10,000! Who couldn’t use that kind of extra cash!? I would be beaming if one of my readers won. The contest goes through April 2015. Cheez-It Crusted Jalapeño Popper Dip recipe tastes exactly like a jalapeño popper with a crunchy, cheesy Cheez-It topping. It's an easy, incredibly tasty and highly addictive appetizer! Mix the cream cheese, mayonnaise, cheddar cheese, parmigiano reggiano and jalapenos in a bowl and pour into a baking dish (Size depends on if doubling recipe or not. Mine fit in a 24 oz. casserole dish when not doubled). Sprinkle the crushed Cheez-Its over the dip. Bake in a preheated 350F oven until the sides are bubbling and the Cheez-It topping has turned golden brown on top, about 20 minutes. *You can smash them in a ziploc bag with a meat tenderizer or rolling pin if you prefer, but I recommend 15-20 seconds in the food processor. Sounds perfect for game day! Cheez-Its are so gooood! My son loves them and I have them as part of his school snack rotation. 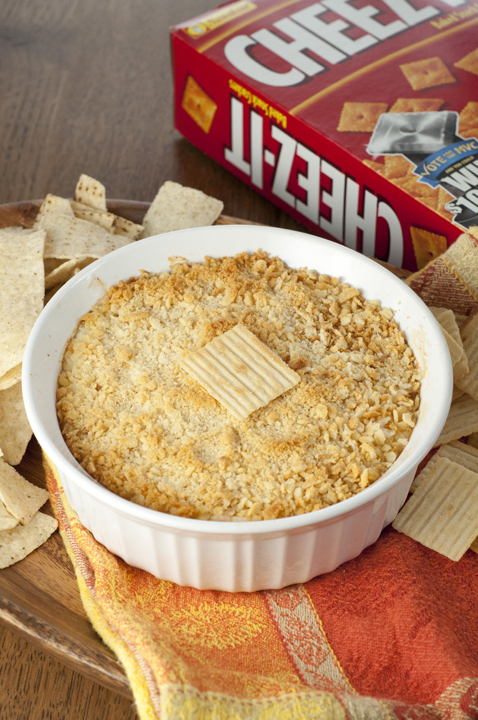 This idea for the dip sounds awesome…the crunchy, cheesy topping from the Cheez-Its has to be so good! Now to find these new cheez-it grooves! I didn’t know that Cheez-It had a new product! I must look for it the next time I go grocery shopping! What?! This sounds crazy good! seriously, BEST game day dip ever!! I can’t have Cheez-Its in the house because I will eat the whole box. But I like the idea of buying some to make this dip…which sounds totally addictive. Wait – cheez-its IN a dip – I have always used them to dip into a dip – but never IN a dip – sounds totally addicting, Ashley! 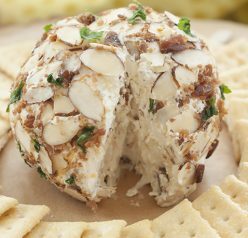 A fun snack for any party! I’m a cheese lover! This looks like one amazing tasting dip. 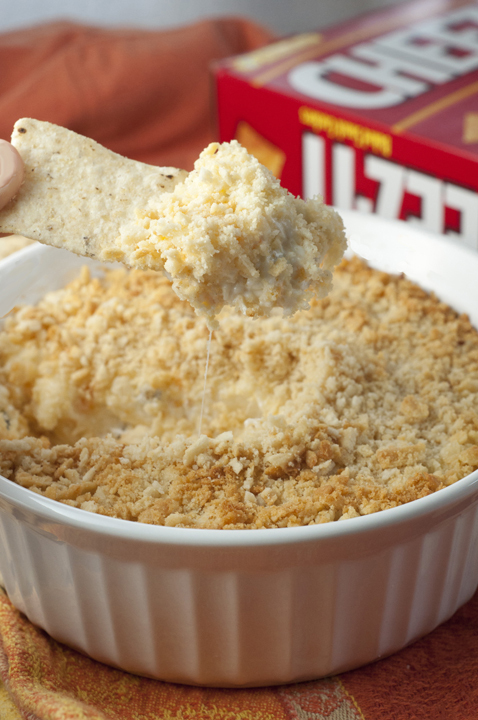 The cheez-it topping puts such a nice crunch to this creamy dip! I love the Grooves and this is a great idea! We love all sorts of Cheez-its and dips in this house, so this sounds like something I need to make! Both my hubby’s and my team have made it to the sweet 16…so we have plenty more opportunities for game day dipping. Love the sound of this. This dip looks like HEAVEN. ON. EARTH! I love using crushed Cheez-Its in place of bread crumbs. This dip sounds so addictive! What a great job you did for this recipe. Love those Cheez-It Grooves! I have a major soft spot in my heart for Cheez-Its! I used to eat them with my dad. And that crumbly topping on the dip? So awesome!!! My family would be all over this. They love cheez it’s! What a creative and tasty way to use Cheez-it! Bet this is tasty! Those Cheez-It Grooves are so, so good! I bet this dip is out of the world good with them! I love everything about this dip and I’m a Cheez-it freak. I can eat a whole box…can’t wait to them in this dip! I had so much fun with this campaign. Those white cheddar grooves are the best! Love how you prepared them! My brother was addicted to cheez it crackers growing up. My mom could not keep enough in the house. Love this dip, such a cool way to use them. I know I could use 10K. Sure would make life easier. I guess I’m living under a rock as I had no idea about the, ummm, Basketball thing haha! I’m cool with it, though 😉 This dip looks sooo tasty!! I bet it didn’t last long. Yummy-yum-yum! That is a great idea, Cindy! I am making this tomorrow for Easter. I’ll let you know how it turns out. I made this today. I doubled the recipe and put it in an 8×8 casserole. It took way longer than 20 minutes but that may be because I prepared it ahead and refrigerated it. With all that said,….it was AWESOME!! Everyone loved it and everyone wanted the recipe. This one is definitely a keeper!! Like I said, I doubled the recipe and I also added the 2 fresh jalapenos (they were big) Don’t be afraid to add the extra jalapenos. Okay, so I am making this dip for the umpteenth time since my last comment. Always a big hit. I absolutely LOVE this dip!